Australia Day is now firmly Local Taphouse Hottest 100 Day in this blogger’s little corner of the world. The annual people’s choice poll of Australia’s hottest (craft) beers has grown into a nation-wide event of countdown fun. It brings together beer lovers/geeks/nerds/fans to share, discuss, dissect and drink (some of) 100 Australian-made beers. 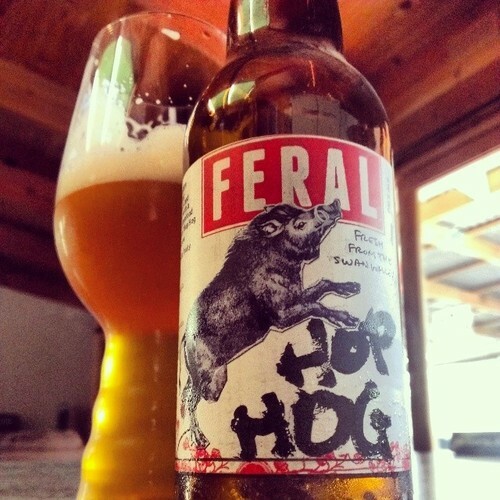 Australia’s Hottest craft beer is the Feral Hop Hog, for the second year running. Organised by The Local Taphouse, the duo of craft beer bars in Melbourne and Sydney, the Hottest 100 Aussie Craft Beers began in 2009 with a poll of 2008’s hottest Aussie beers (all inclusive, big and small). Today, the poll is limited to Australian craft style beers regardless of ownership but excluding most mainstream beers. For the first time this year, official venues were linked to the Australia Day reveal of the poll results. Twenty craft beer focused bars and pubs around the country held events to coincide with the Hottest 100 Aussie Craft Beers countdown and poured some of the top ranking beers. The countdown kicked off at 12:30pm, on a sunny and hot Australia Day in Melbourne. We were at home enjoying our traditional Australia Day bbq lunch on our deck with local beers and the TripleJ Hottest 100 music countdown playing on the radio, while the Hottest 100 beers countdown played out online across social media. At 3:00pm, with the Hottest 100 beers countdown approaching the top 20, we headed to our local – Belgrave’s beloved Oscar’s Alehouse – one of the official venues for the Hottest 100 beers countdown. The bar was lined with happy drinkers glued to their phones, watching the countdown results reveal via twitter and on the Australian Brews News and The Crafty Pint websites. People were absorbed by the updates and engaging on Untappd, but that didn’t make anyone anti-social. Far from it. The conversations and social interactions flowed across the bar, from end to end. The atmosphere was lively and positive, friendly and fun, as drinkers enjoyed their beers and chatted about the countdown results and all the good things about beer. Admittedly, that’s how it is at Oscar’s most the time, but this time we were all engaging on the same topic at the same time: Australian beer. As I was controlling the Brews News Twitter and Facebook feeds during the countdown, I knew the results already, yet I was still caught up in the excitement generated by the countdown. 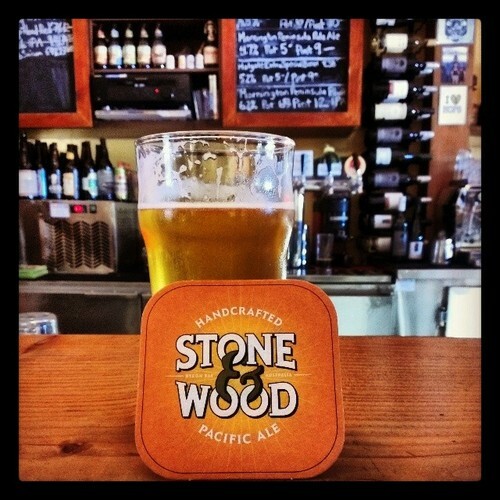 Stone & Wood Pacific Ale is a hot day favourite. It was especially fun to drink pints of the top 2 beers – Stone & Wood Pacific Ale (#2) and Feral Brewing Hop Hog (#1) – on tap at Oscar’s as their placings were announced. During the afternoon we also drank Mountain Goat Hightail (#27) and Summer Ale (#6). Personal favourites. We also enjoyed the very new Mornington Black IPA, which is delicious. Roasty, malt, full and long. Another great beer of balance and well constructed character from Mornington Peninsula Brewery. 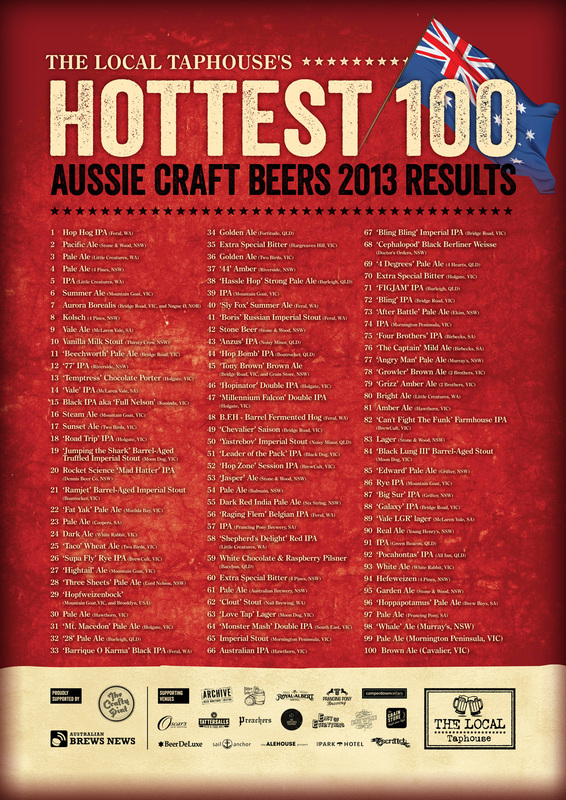 Back to the Hottest 100 Aussie Craft Beers poll… I really liked the list this year. I found it to be a very interesting spread of new beers, old favourites, extreme beers and straightforward yet delicious and quality beers. Something for everyone! In my mind, it was a very fair list of results, and a good result of today’s Australian craft beer market. The deliciously good new Black IPA from Mornington. For the first year, there weren’t any beers that I thought didn’t deserve to be there or in their relative position (or maybe I’m just getting soft…). I’ve tasty the vast majority of the beers that placed in the poll, and consider pretty much all of them to be worthy of “hottest” recognition. My number 1 beer of 2013 didn’t make the list, Red Hill Brewery’s Double Barrel Aged Imperial Stout. This didn’t surprise me. It was a very limited beer from a very small brewery and at $25ish for a 500mL bottle, few people would have bought more than one (I think I’ve purchased 5 bottles so far). Same goes for another of my 5 votes, the Murray’s & Crafty Pint Auld Bulgin’ Boysterous Bicep Smoked Belgo Imperial Mussel and Oyster Stout. In contrast, the also very limited and expensive Moon Dog ‘Jumping the Shark’ Cognac barrel aged truffled Imperial Stout, which I voted for, score an impressive Top 20 spot at #19. And so did the $80/750ml Nail Brewing Clout Stout (#62), both deservedly so. My other 2 votes both placed – Mornington’s Imperial Stout (#65) and Mountain Goat’s Summer Ale (#6) – so I scored 3 out of 5. How could the poll be improved? I think that the biggest issue threatening the long-term sustainability (in terms of interest and relevance) of this poll is that the top 10 tend to be very similar each year. The top 3 haven’t changed much at all over the life of the poll. The fix? Take the TripleJ Hottest 100 approach and make it a poll of the hottest 100 Australian beers from the last calendar year. I don’t think this would have been possible until now, because there haven’t been quite enough new Aussie beers in a year to suitably fill a poll of 100. But now, the Australian beer industry may be able to fill a new-beers-per-year poll. Until then, I don’t see the current status quo of Feral Hop Hog, Stone & Wood Pacific Ale and Little Creatures Pale Ale being significantly dislodged from top spots for some years. My other suggestion for a minor improvement is to give voters up-to 10 votes instead of just 5, which will increase the overall votes received and spread the votes across more beers. In response to those who attack the “craft beer” values of the poll, my position is that the craft brands of macro brewers (CUB/SABMiller’s Matilda Bay, Kirin/Lion’s James Squire/Little Creatures/White Rabbit) and Coopers are welcome in this poll. Why? Because those are the Australian born and brewed beers that started me on what I call my “craft beer journey”. They are a valid part of the market, introducing many of us to the wonderfully diverse flavours and styles of craft beer. We all started somewhere, and like most local beer geeks, I started heavily with James Squire, Matilda Bay and Little Creatures. I also suspect that such beers will naturally score fewer votes over time, as the small independent brewery market grows. Changing the poll to “only new beers of the previous year” would definitely impact their presence in the results. Otherwise, to anyone who criticized or attacked the Local Taphouse Hottest 100 poll this year, I say to you…try doing better yourself. And to any detractors… just remember, this is a poll of favourites voted by the general public. When it comes to beer, favourites can be determined by almost anything: brand, brewers, beer style, locality, personality, experience, social group influences, whatever. For what it is, I think the results reflect all those factors nicely. Well done Local Taphouse team along with The Crafty Pint (and Australian Brews News, of which I’m a part). We had fun. Looking forward to doing it all again (bigger and better, I’m sure) next year. Cheers! To discover the evolution of the Local Taphouse’s Hottest 100 Aussie Craft Beers poll, check out the “Hottest100” tag on their blog. Tags: bars, beers, hottest100, local taphouse. Bookmark the permalink. I have to agree with you on the validity of having the craft arms of the big boys in there. When out comes down to it, these are beers I STILL drink when I head into my local BWS to pick something up (I don’t drive and the craft bottle shop is quite a journey). With the influx of new people trying beer with flavour is what’s keeping those top spots in the same places. Having those beers available to be voted on also makes the list more accessible to your average Joe. If the list consisted of only beers released that year, you would have a ton of labels your average punter would be unfamiliar with, making them less likely to vote. If they don’t vote, they don’t really care about who places where, and if they don’t care, they won’t see all the other beers on the list that might peak there interest and get them to try something new. A polling sheet, divided into brewers/parties, with a huge line near the top. Now you can either preference above the line for the breweries, and they prioritise their favourite beers (a slight deviation from senate voting) or select a preference for EVERY SINGLE BEER below the line. It would be tiring, fiddly, and expensive to do. But so is brewing good indie beer. Jack, that is a genius idea! 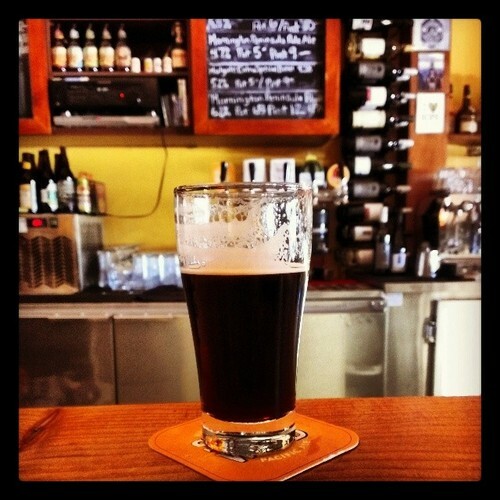 Maybe we should start our own poll: Australia’s Craft Beer Referendum! Every beer numbered. Voting is compulsory. The results would be incredible.